There hasn’t been much about this model on this forum, so I thought I’d report my experiences in a mini “review”. Power is provided from a 6s pack, rather than a 4s. I bought the ETO colour scheme version, which comes with 2 marking sets – I chose the scheme for Bob Stanford Tuck’s machine. Assembly was relatively straightforward. As always with ARTFs, I first checked all the electrics worked with my servo tester. I then looked at potential problem areas highlighted in the (mammoth) thread on RC Groups. The only common problem I found was the top clip-in rudder hinge was a bit slack for my liking, so I glued in a Robart hinge adjacent to it. All servos were securely installed, and I checked all the u/c grub screws were tight. I did discover a couple of previously unreported u/c issues. The wheels didn’t rotate freely due to paint creeping onto the axles, which was easily cleaned off. Also, the u/c doors are a little long for scale – I trimmed 10mm off the bottom edge, which looks right and should reduce grass drag. Another mod I did was to attach the radio mast and cannon using magnets, so they can be removed for transport and storage. The markings are the thin vinyl type with a clear front positioning sheet which peels off. These were a bit fiddly to apply, but seemed to stick ok after application of a warm iron. As insurance, I painted the edges with matt varnish, then gave the whole airframe a thin coat of Plasticote matt aerosol. I also applied some weathering. The prop needed a little balancing, and with a 3000mAh 6s pack installed, the c of g was as per instructions. I haven’t measured the power as I didn’t have a helper to hand – this thing has serious thrust, I’m guessing it pulls around 1kW. RTF weight is exactly 6lb. I was a bit apprehensive when I arrived at the field as the strip was in need of a mow and a roll. However, I needn’t have worried. Power was applied gradually with full up elevator initially, this was eased off as she gathered speed. Take-off occurred at just over half throttle, with a decent climb out at this setting. I had to do some minor trimming, but she flew a treat using the high rates from the instructions, with 30% expo. I only used full power for the verticals, most of the flight was at half throttle. I flew a couple of circuits with full flap and tickover power, she seemed to slow down just fine. I must admit I forgot to explore the stall. I landed on the strip first attempt, full flap and about 20% power kept on until the wheels touched. It was a little untidy as the wind swung and she rocked onto each wingtip, but there was no inclination to nose over. 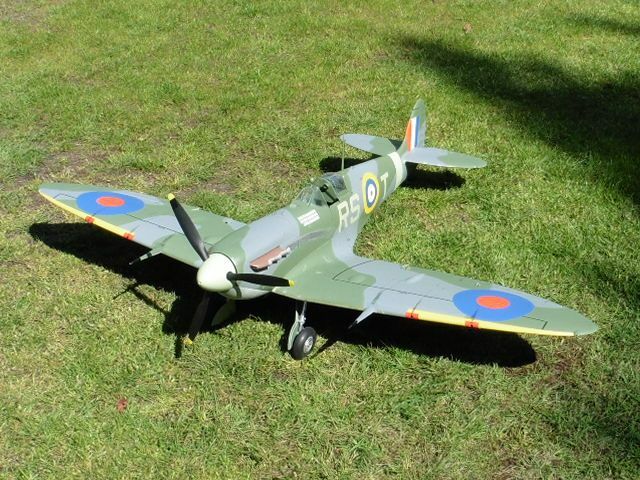 The second flight was more confident, with a more scale take-off at half throttle, and plenty of Spitfire aerobatics. She flies and looks superb. The second landing was much tidier, I got the tail down to almost a 3-pointer, and she kissed the grass gently. The timer was set to 6 minutes for each flight, and my checker showed about 50% capacity remaining, so duration is good. I must now source a half-body 1/8 scale pilot to fill the empty office. Real Model Pilots looks a good source, has anyone used them? If I’ve missed anything, please feel free to ask questions. Finally, if editor Graham reads this, it’s clear you like foamy warbirds. You should get one of these, you’ll love it! On Easter offer this morning at £227.08 from HK EU warehouse for those interested. I think free carriage too. 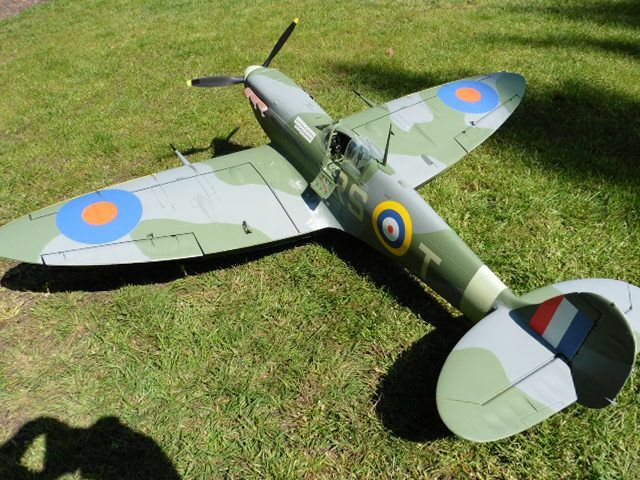 Very nice Spitfire, I like all the detail that it has and glad to hear that it flies well. Spitfires are stll one of the most beautifull aircraft ever designed. I never seem to catch the bargains! Yes, it's more than I've previously spent on an ARTF, but you couldn't build and fit one out for less, so it seems fair value to me. Despite rc modelling for about 50 years, my skill and patience doesn't extend to scale warbirds, I stick to Peter Miller type models for my building. That's one of the positives about the hobby now, so much variety. A typical carload for one of my flying sessions is PM's Ohmen (self built), Sebart Angel (wood ARTF) and a foamy warbird. 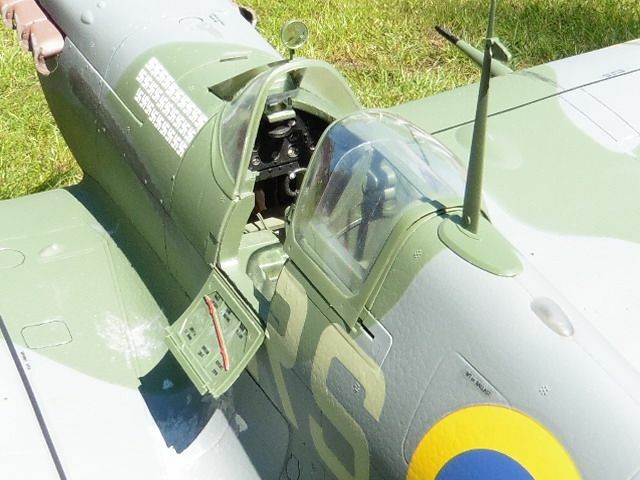 Forgot to mention, the Spitfire also has nice metal, sprung oleo legs.